For the past 9 or 10 years we have been sponsoring a girl by the name of Kadiatou, who lives in Mali Africa. We make a small monthly donation through World Vision which helps to improve her quality of life and the overall program supports schools in her village. We receive updates and pictures a couple of times a year and we are encouraged to send her items that will fit in a small envelope as well as to write letters to her. 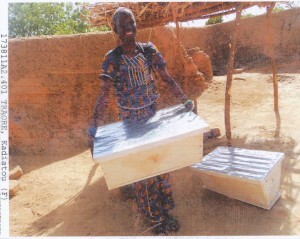 World Vision helped me get hives to a family in Mali. We often find these letters a bit difficult to write. We have very little in common and are careful to not include a lot of detail about material items. Lets face it….the average American can not relate to the daily struggles that the average African villager has to face, nor could an average 14 year old girl from Nonsombougou, Mali have any concept of what it is like to live in our world. We are not only separated by half a world but by language (she speaks French), religion, polotics, currency, life style, terrain, weather, education and basic daily concerns. As a result our letters are pretty generic. She writes to update us on her education, what her interests are and usually draws a picture….our letters include topics about the weather, animals, and encouragement. Each letter from us has to be translated from English into French…..and each letter from her needs to be translated from French into English. We did learn, however, that her Dad is a farmer. They plant sourgum and have a goat and a cow……which leads me to why this story is on my bee blog. A couple of months ago I sent over an inquiry through World Vision asking if Mr. Traore, Kadiatou’s Dad, would be interested in adding bees to his farm. To my delight his answer was yes. A phone call and a couple of months of waiting we just learned that their bee equipment has arrived. I immediately sent out a letter to Mr. Traore congratulating him on his new arrivals. As I wrote the letter it occurred to me that now we have something in common, something we can both relate to on every level. We will have the same concerns, want to know the same things and will try to solve the same mysteries. We now share a common language……the language of bees. If you are interested in sharing the investment in a hive click here….or you can click the beekeeper below to donate/invest in the whole set up for a new beekeeper. Your investment will change lives. As I get updates from Mali I’ll post them here. In this way you can get a glimpse into beekeeping in the Pacific Northwest from me….and beekeeping in Mali Africa from Mr. Traore…..the newest beekeeper in our family.